With the New York Toy Fair coming next week, WizKids is busy making announcements. Today they announced what I believe is a new genre, the puzzle building game. The series is called Connect with Pieces. Leading entertainment conglomerate and game creator NECA/WizKids is taking puzzle gaming to a new level, today announcing Connect With Pieces™, an upcoming puzzle building platform and game combining strategy and challenge designed by Joel Weinshanker, president and COO at NECA and board game designer Mike Elliott. While I would normally be skeptical, this is designed by Mike Elliot. He definitely has a lot of game design experience. 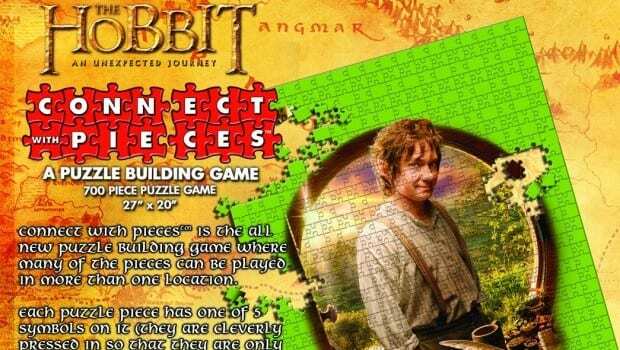 While the Breaking Dawn puzzle won’t apply to most of us, The Hobbit and The Lord of the Rings themed puzzles should. They aren’t very expensive either, which may make it a fun weekend diversion. Take a look at the full Press Release for more details.